It is not that difficult to create a rule on Exchange forwarding all emails (e.g. sent to a given user) to a different user. But if the forwarding address is an external one, you first have to create a mail-enabled contact on Exchange or a separate distribution group for it. So… If someone comes to you with this type of request: “I’m off for the next 5 days, please forward important messages to my Gmail account”, what will you do? Naturally, you can follow this procedure, but the problem is that you can only forward ALL emails to the external account, because Exchange will not filter them in any way. Sifting through emails and forwarding selected ones manually is obviously not an option either. sensitive content found in the message (e.g. if someone writes “youtube” in a message, this email can be forwarded to the manager as it may contain a YouTube link). With all these functions at your fingertips, routing, re-route and forwarding messages in all conceivable ways is a piece of cake. You can use the application as an automatic email forwarder/autorespodner when workers are out of office. You can also easily create robust content checking Exchange mail algorithms, that will alert admins or selected managers about improper behavior, verbal abuse, illegal attachments (e.g. mp3 files) by automatically forwarding those messages together with their content to respective users. You can decide not to forward any meeting requests, non-delivery reports, internal messages or any other correspondence that might be of no value. 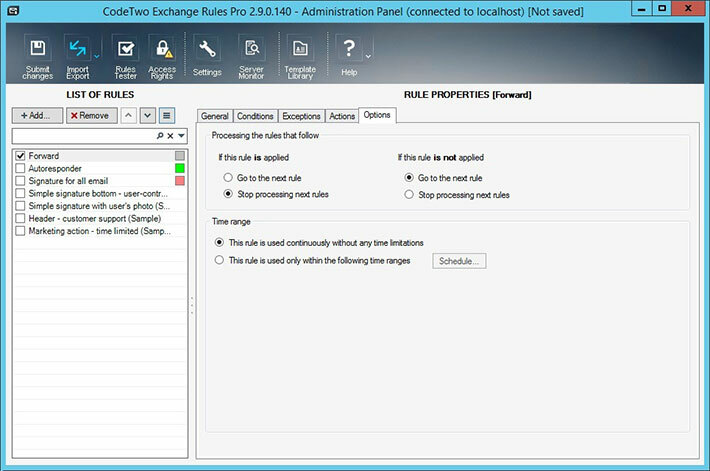 Basically, CodeTwo Exchange Rules Pro gives you limitless possibilities and is a must-have for any organization using Exchange Server 2010 / 2007. How email forwarding on Exchange works? 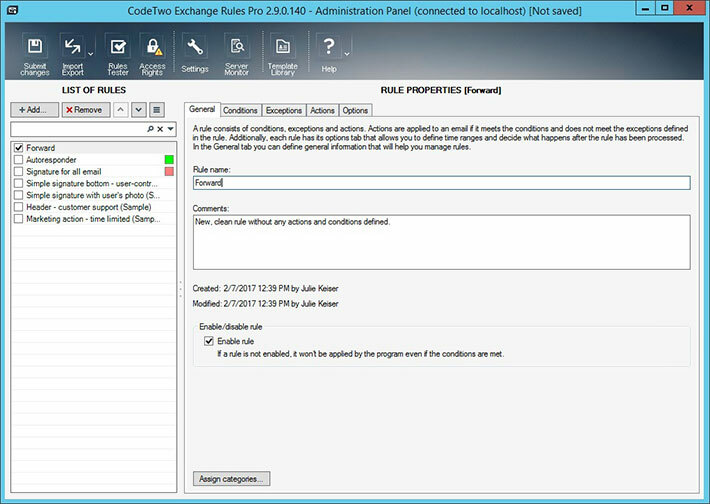 Just run the administration panel of CodeTwo Exchange Rules Pro. Click the Add button, select New rule (clean) and, in the General tab, type in your new rule’s name (Fig. 1). Fig. 1. Creating a forward rule on Exchange using a smart third-party application. Once the rule has been created, go to the Conditions tab to choose what conditions need to be met to activate this rule (Fig. 2.). Fig. 2. Selecting conditions for a new Exchange forward rule. When you have defined your conditions, you can finally move on to the Actions tab. Actions describe what happens with your message when the program, based on predefined conditions, starts to process it. In this case you have to select the Forward message option from the List of actions (Fig. 3). Then, select where those messages should be forwarded – either to one or many users, or maybe to an AD Group? Fig. 3. Selecting the Forward message action on Exchange Server. You can also set some exceptions in the Exceptions tab. However, it is not necessary and you can proceed straight to Options (Fig. 4). Fig. 4. Additional options for forwarding mail in Exchange. Options let you specify a time range for this rule (by default it is set as a permanent rule) and what should be done once this rule is processed: should the program process more rules or maybe stop at the current one? It’s up to you. And this is all you have to know to create simple or endlessly complex forwarding rules for Exchange Server mail. 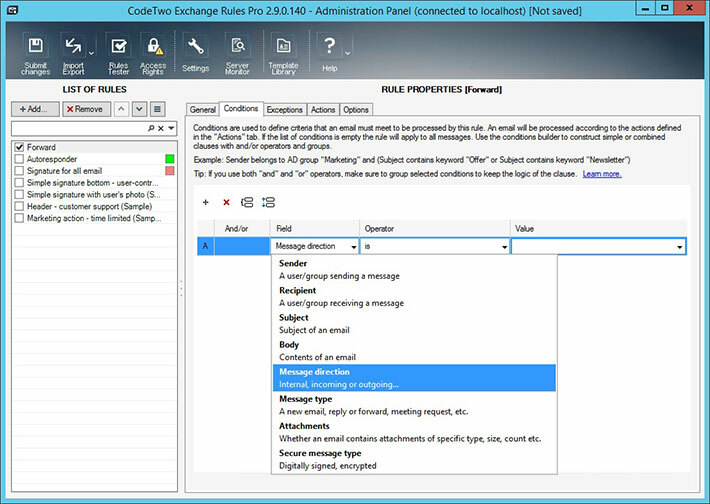 If this wasn’t enough, CodeTwo Exchange Rules Pro is not just an email forwarding tool for Exchange 2007 / 2010. 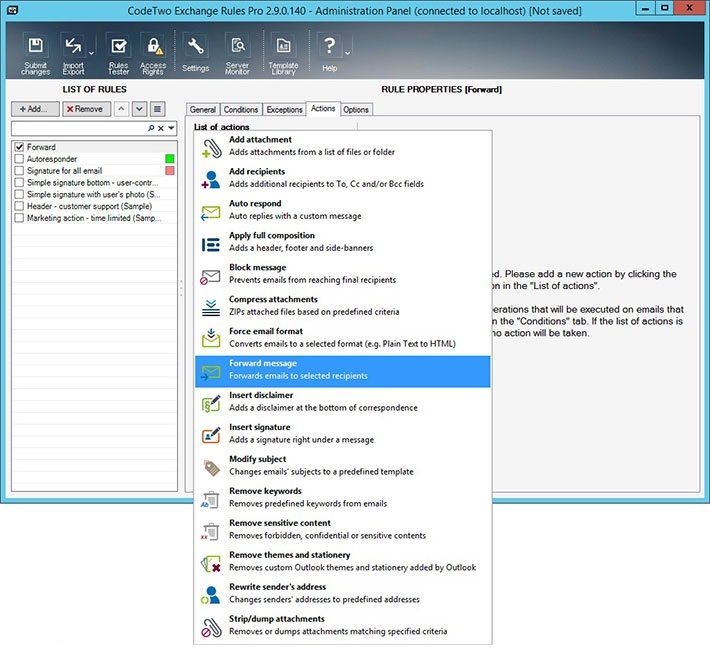 It’s a complete Exchange management utility that will let you create email autoresponders, rerouting rules, apply spam filtering on Exchange, create content checking rules, filter messages and attachments, add various signatures, disclaimers and email banners to Exchange messages and run email marketing campaigns. Try it for free for 30 days. Click here to download CodeTwo Exchange Rules Pro for free. Does it work with Exchange 2013?